Arrays loaded with flash drives are the speed kings of storage arrays. 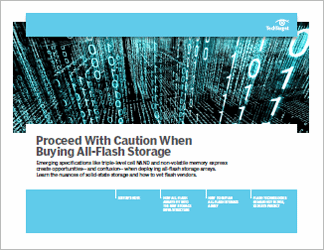 They can also be more expensive than traditional systems with hard disk drives (HDDs), so IT managers need to assess their application needs to make the best decision among all-flash array vendors. Cheap HDDs give traditional arrays an advantage in price per GB, but systems equipped only with more costly flash drives can provide a significant edge in price per IOPS. 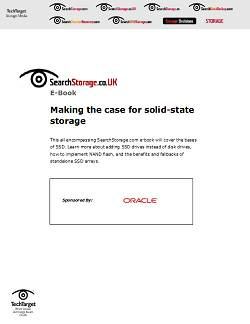 Hybrid arrays combining HDDs and solid-state drives (SSDs) are yet another option to consider when balancing the price-performance equation. 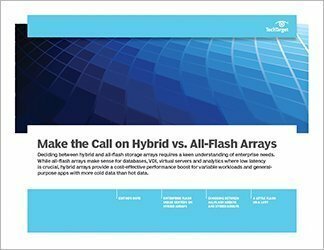 Points of comparison for IT organizations weighing the various options from all-flash array (AFA) vendors include IOPS, latency, throughput, raw and usable capacity, flash type, networking options, architecture type (scale-up vs. scale-out), and supported storage features, such as data deduplication and compression, thin provisioning, snapshots, replication and encryption. The original use case for AFAs was typically to accelerate the performance of a niche application with high I/O requirements. 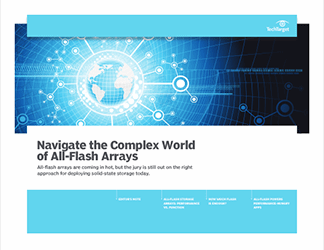 AFAs have since become more popular for primary storage, running multiple application workloads on a single flash array now that the products offer the capacity, management and storage capabilities to put them on par with HDD-based systems. 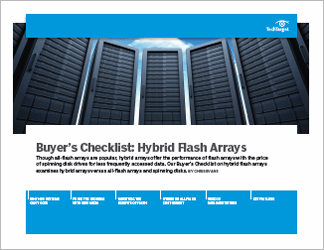 The use of denser, less expensive flash, such as multi-level cell and triple-level cell 3D NAND, and data reduction technologies are giving rise to claims from AFA vendors that their products can match or beat the price of high-end storage arrays equipped with the fastest spinning disks. So IT organizations need to compare the features and capabilities of many of the leading AFAs against specific criteria to select the right AFA to meet their technical and business needs.